This classic Louvered Air Cleaner is made to fit a CV carburetor and EFI (electronic fuel injection) throttle body, as found on 1991-2019 Harley-Davidson XL Sportsters. 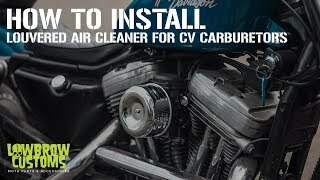 On Sportsters the CV carb and EFI bolt pattern are the same. The Louvered Air Cleaner will also work on 1993-2006 Harley-Davidson Big Twins that have a CV carb. It will not work on any fuel injected Big twin as the bolt pattern for those models will be different. Included are a black powder coated backing plate, paper filter, chrome louvered air cleaner cover with mounting bolt, mounting hardware and a carb-to-backing-plate gasket. The backing plate uses low-profile, stainless steel allen head bolts (hardware is included) to mount to the carburetor. When installed on motorcycles with CV carburetors a carburetor support bracket must be used. A support bracket is not necessary when installed on bikes with EFI as it has a factory support bracket integrated into the throttle body. Crankcase breather bolts are also needed and are available in black, chrome or brass. 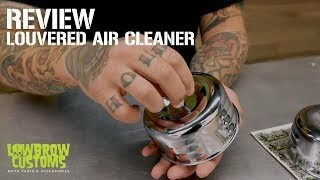 This well engineered air cleaner is inexpensive but oozes style. What else could you want? The air cleaner measures 4-5/8" diameter by 2-1/4" wide. There are also premium, washable air filter elements sold separately to replace the standard air filter that is included. Made in the USA. Perfect match for a minimalistic Street Bob. Bolts on fast . Simple product . Appears to be well designed . The finish is nice in black . I paired this with the lowbrow breather bolts as well . Looks clean . American made. OH-IO!!! Design is cool and installation was easy. Filter housing could be alittle bigger but very happy with air filter assembly. Appears to be well made. The three screws that come with it could stand to be a bit longer. After it’s mounted to the carb support bracket and carb there are only about 3-4 threads holding it on. Otherwise, no complaints. Love the clean and somewhat old school look this kit gives my bike. Two thumbs up.